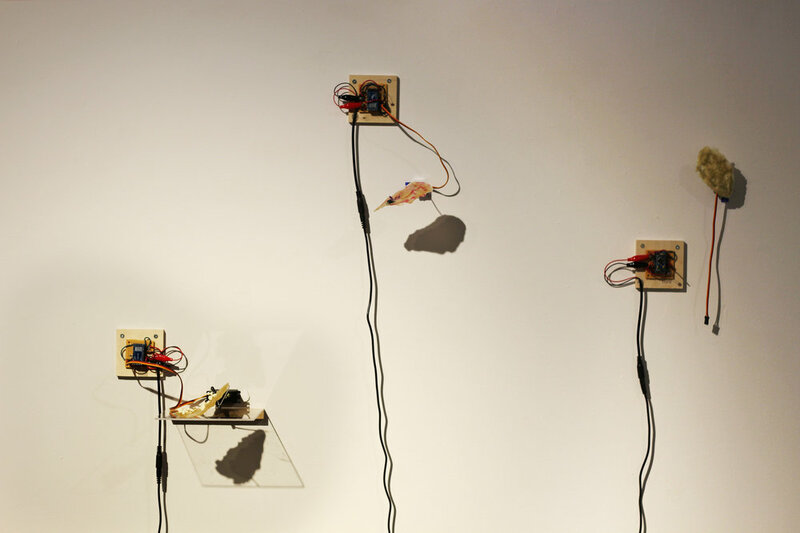 The sculptures are displayed on the wall, accompanied by a small circuit board. The flexible sculptures are supported by simple plexiglass shelves, installed at different heights. Seriality is evident in the shapes and display of the sculptures, yet each is still treated individually with variance in arrangement and behaviour. The space is dimly lit to create a more intimate relationship between the quivering sculptures and the audience. The lighting serves as the main tool of interaction, as the sculptures are influenced by photocells attached to the circuit boards. The delicate sculptures and their unique gestures create an atmosphere of tenderness, yet the exposed technology and plexiglass shelves offer the sculptures to the viewers for clinical investigation. The installation provides a familiar experience to otherwise unfamiliar and unapproachable objects, allowing the viewers to closely engage with the sculptures without much hesitation. The sculptures movements indicate a sort of pained or frightened existence, quivering in reaction to the viewer’s presence. Each sculpture is installed at a different height to create a different relationship with the viewer. The sculptures elicit feelings of intrigue, tenderness or sympathy depending on the interpretation of the viewer. While some see the movements as excited and endearing, others want to put the sculptures out of their misery. Eventually, the sculptures are put out of their misery. 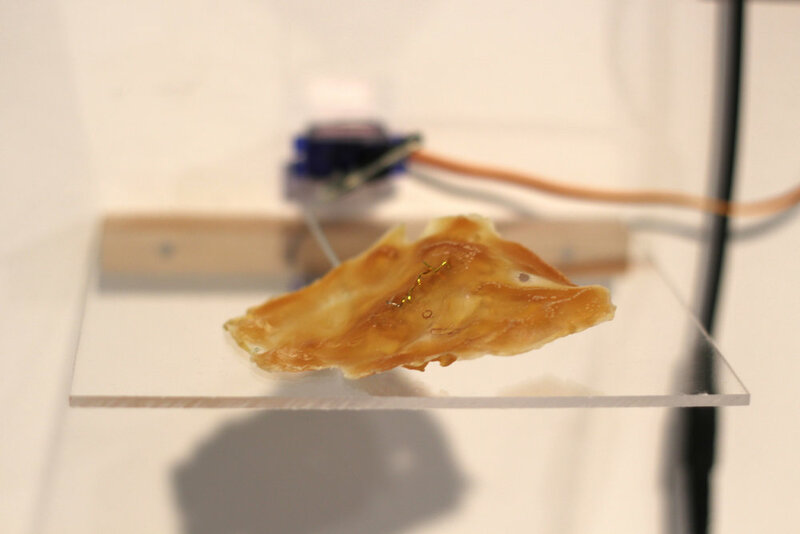 As the exhibition goes on the servos overheat and malfunction, requiring them to be unplugged until they cool down and are able to function again. As time passes the organic material doesn't degrade, but the technology supporting it does. As the sculptures need to be unplugged, the atmosphere becomes more uncertain, and viewers are unable to discern which sculptures are responsive and which are not.